This looks awesome! 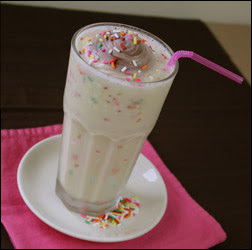 It is Hungry Girl's new Happy Birthday Cake Shake! Click here to view the recipe. I wish I had all of the ingredients. I might have to make a quick stop at the grocery store today. :) Yum!